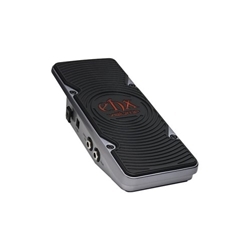 A volume pedal you can rely on! The Electro-Harmonix Volume Pedal, part of their Next Step Effects Series, has no moving parts or potentiometers to wear out. You've got dual outputs, so you can easily connect to a tuner or separate effects chain. And the Volume Pedal gives you control over the bypass volume, so you don't have to worry about your tone changing when it's not in use. If you're playing out live, you'll appreciate the near-bulletproof reliability of the Electro-Harmonix Volume Pedal.